Now that's we've talked about raw food *cough* Mr. Giant Rat in our previous post titled 'Whose Blood is It? ', 'time to discuss other matters. Puppies grow 20 times the rate of adult dogs so it’s important that they have a special diet to help them develop physically. They need to be fed at evenly spaced intervals, otherwise you can stretch their small stomachs. You should take the advice your breeder has given you about your puppy’s diet. Your puppy should have 4 meals up to 4 months, 3 meals up to 6 months, and then 2 meals a day for the rest of it’s life. The quality and range of dry complete foods out there vary widely. To get the most out of your dog’s food you should buy the best you can afford for them. ‘Premium’ foods based on chicken or corn tend to have the highest quality ingredients. Puppy food from Wuffitmix is a great choice. When it comes to quality, the same goes for semi moist canned foods. A good quality food with good quality ingredients is essential for your puppy. The difference between dry and fresh foods is the water content. 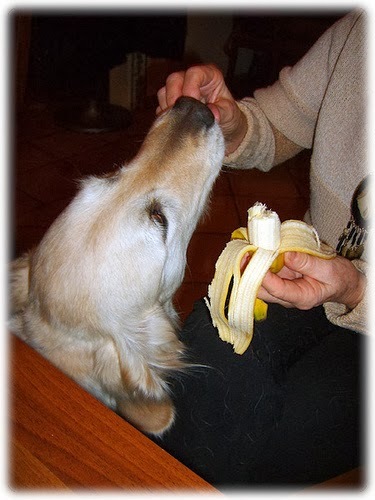 It’s up to you which you choose to feed your dog - choose the kind he responds best to! It’s difficult to get the balance right with homemade food, so it’s important you only decide to feed them homemade food if you know what you’re doing. A tiny imbalance could throw your puppy’s whole digestive system out of whack! You need to take a careful look at the ingredients when it comes to treats too, as the ingredients in them can include sugar, milk, and fat. Even food described as ‘puppy chocolate’ can contain these ingredients, so make sure you check it out. All treats should be given in moderation to avoid obesity, and never feed your dog human food! Don’t feed your dog before travelling, as this can cause sickness. Always make changes gradually in a dog’s diet to avoid tummy upset. Leave your dog alone while they’re eating from their bowl. Never feed your dog from the table or your plate, as this will make them beg in future and sit by you and drool (gross!). It’s important that you’re prepared to do everything it takes to keep your puppy healthy and happy - follow our advice and you can’t go wrong! OMD we remember the travel sickness one well and even not being fed didn't do the trick. Great points. Have a fabulous Friday. What's the reason for "Leave your dog alone while they’re eating from their bowl"? I love watching my dog eating. Is there a real reason for this?